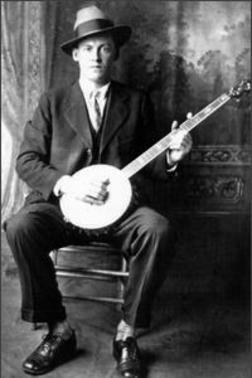 Saw a PBS documentary on the history of the banjo in American music last night and qhile it wasn’t the greatest documentary I have ever seen there were a few stories that really stuck out for me, primarily the story of Dock Boggs, who lived in the minig region that straddles southwestern Virginia and eastern Kentucky, was born in 1898 and as a young man picked up the banjo and developed a distinctive style of playing. In the late 1920’s he gained a bit of regional fame with his music and recorded 12 songs in two separate sessions. Then his career died in the dust of the Great Depression and he pawned his banjo and headed back into the coal mines, his music put away for what he thought was forever. Thirty years passed and folklorist/folk musician Mike Seeger, brother of folk icon Pete Seeger, was seeking out Appalachian music to document in 1963 and remembered the impact of those few songs from Dock Boggs’ past. Boggs was surprised when Seeger sought him out because he thought nobody remembered those songs from so many years before. Fortunately, Boggs had recently purchased a banjo and had been practicing for a few months. Seeger convinced him to appear at a folk festival in Asheville, NC and after that his career was revitalized in the folk revival of the 1960’s. He recorded three albums and toured, playing folk festivals including an appearnace at the Newport Folk Festival, until his death in 1971 at the age of 73. He left this world knowing that the gift he was given had not been completely lost in the coal mines. I think it’s a great tale of a life’s passion lost and found. Could be the subject of one of his songs. Here’s an older Dock Boggs playing one of his classics, Country Blues. This version is a bit more sudbued and a little less ominous than the original, recorded when he was young and still living a hard-drinking, brawling life. You can hear the original here. For those who missed “Give Me The Banjo”, more information (including a few videos) can be found here. And speaking of the banjo, I just watched (on Hulu) an interesting 2009 documentary featuring Béla Fleck and his trip to Africa to discover the roots of the banjo. It’s called “Throw Down Your Heart”. I think it’s worth a look. And a listen. Thanks for the reminder of Dock Boggs, and the info on Béla Fleck’s documentary. If I closed my eyes during the women’s singing at the end of the trailer, it might as well have been Saturday night in the bush. Many of the instruments shown weren’t common in Liberia, where drums and rattles tended to predominate (at least in my area). Still, there were some folks who could make a kalimba stop a crowd.